MAKOLA, Sri Lanka (CNS) — When Pope Francis made a surprise visit to a prominent Buddhist temple in Colombo Jan. 14, the head of the Maha Bodhi Society of Sri Lanka reciprocated by showing the pope historical relics of Buddhas’ disciples, normally exposed only for the annual Buddhist feast in May. “The pope’s visit to our temple was a historic gesture. We have found that the last time a pope entered a Buddhist temple was in 1984,” Venerable Banagala Upatissa, president of Maha Bodhi Society of Sri Lanka, told Catholic News Service Jan. 15. The 25-minute papal visit “was a gift to the whole Buddhist world. That is why we decided to show him the relic,” Venerable Upatissa told Catholic News Service during an interview at his residence complex at Makola, 10 miles outside of Colombo. The Maha Bodhi temple is known for the relics of the two disciples of Lord Buddha — Arhat Sariputta and Moggallana — brought from the Buddhist holy land of Sanchi, India, in 1952. The relics, Venerable Upatissa pointed out, are taken out from the special enclosure only once a year, for Buddha’s birthday in May, for public veneration. “We broke the tradition to honor the pope,” said Venerable Upatissa, adding that the monks had about 35 minutes’ notice that the pope would visit. “People are divided into different groups because of religion. 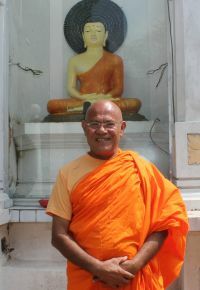 In the 21st century, religious leaders have to play a positive role to unite (their) communities instead of dividing,” said the monk, in whose room is displayed prominently a picture of a meeting with Pope Benedict XVI in 2007. “We have to spread the message of harmony and respecting each other. Then only there be peace in the society,” he asserted. He said he hoped Pope Francis’ visit would lead to greater interaction between the two communities. In Sri Lanka, two-thirds of the 21 million people are Buddhist, while Christians account for over 7 percent. On the way to the airport Jan. 15 for a flight to the Philippines, Pope Francis made a brief stop at the Benedict XVI Cultural Institute in Bolawana, outside of Colombo, and blessed the chapel in the middle of the sprawling complex. 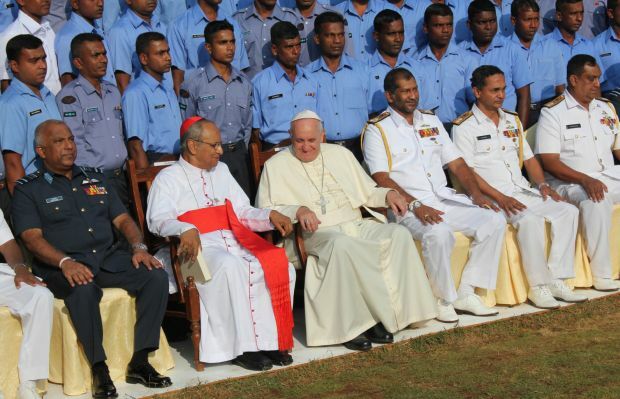 Top defense officials then led him to pose for a photo with more than 100 uniformed military and Cardinal Albert Malcolm Ranjith of Colombo. Venerable Gnanabassi, who heads the Jaya Sudarshana Buddhist temple near the center, attended the ceremony. “The Buddhists are very happy to receive the pope. We have good relations with the Christians,” he told CNS.